Any College Place and Kennewick drivers who head to Walla Walla Valley Honda from May 20 to May 28, 2016 will be able to take part in the Extravaganza Paloozathon. Fun for the family and great offers for drivers will make this an event you won’t want to miss, so make sure you come to our dealership to take full advantage. The Extravaganza Paloozathon is a fantastic time for College Place and Kennewick drivers to head to our showroom, pick out something they like, and then drive it home. You know what, though? It’s also going to be the ideal event for those who just want to kick back, relax, and enjoy themselves. During our Extravaganza Paloozathon event, visitors on Fridays and Saturdays will be able to eat free hot dogs, snack on free chips, and quench their thirst with a couple of icy cold sodas. If free food and good company is your thing, the Extravaganza Paloozathon is going to knock your socks off. Come on over and hang out with us! $250 off the promise price of ALL vehicles. If you buy a vehicle, we’ll let you take a spin on the Wheel of Awesomeness, which offers a variety of giveaways. Most car dealerships center their philosophy around words like “service.” At Walla Walla Valley Honda, we take it a step further by answering a different call: the call of Awesomeness. From our Principles of Awesomeness up to our fantastic events, we take the concept of fun and run with it, and that’s why you’ll be able to visit us soon for the incomparable Extravaganza Paloozathon! 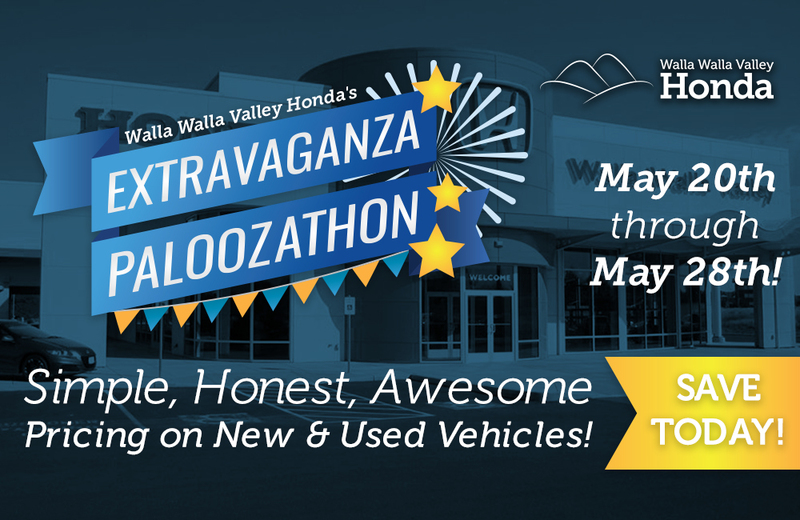 The Extravaganza Paloozathon is blowing up at Walla Walla Valley Honda from May 20 through May 28, 2016, and we can’t wait to begin. We’re proud of our commitment to College Place and Kennewick drivers, and we can’t wait to see as many as possible attending the Extravaganza Paloozathon event. If you’d like to hear more, just contact us today.